To upload comma-separated values (.csv) files into your application, you can use the Data Import wizard or the data import File Listener (large data volumes only). This article explains how to use the Data Import wizard. If you are using the data import File Listener, skip this article. For more information, see Using the data import File Listener. Open the Data Import wizard. Log in to Pega Sales Automation as a Sales Operator. In the navigation pane, click Tools > Data Import wizard. 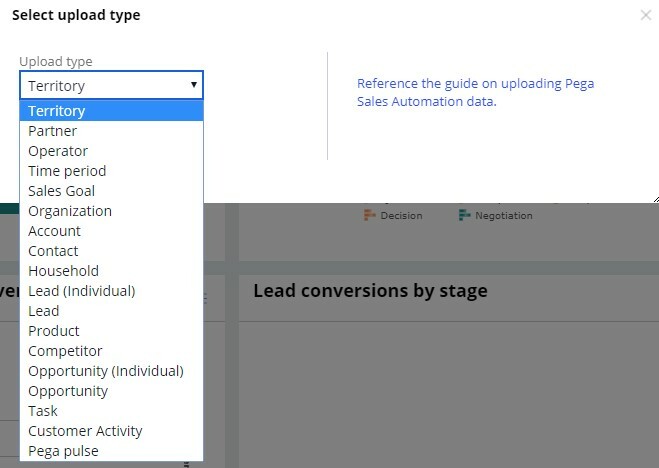 Select the data type that you want to import. The types need to be imported in the order that they display in the drop-down menu due to their dependencies. To add only new records, click Add only. Updates to existing records are ignored. To add and update records, click Add or update. Click Choose File and select the CSV file that you want to import. If the purpose is set to Add or update, you can use the Update type to control how empty fields are handled. If the purpose is set to Add or update, the Match existing records by option allows you to choose the field name with which existing records in the system will be identified for update. 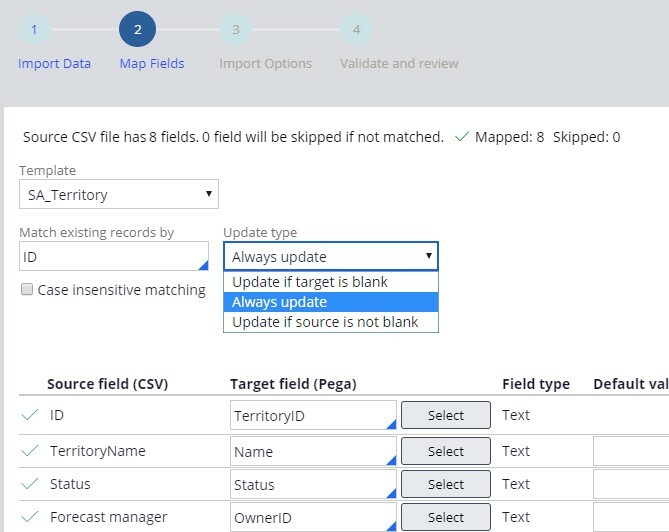 Optional: To save mappings configured on the Map fields page in the wizard to a new or existing template for future use, select Save import settings. If this is the first time you are loading data from a data source, clear the Skip running validate rules check box. Load only a few rows of data as a test before loading a full record set. 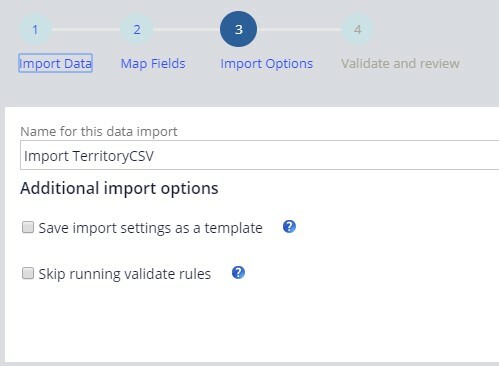 Once you are confident about the quality of your data, select the Skip running validate rules check box to reduce the throughput. 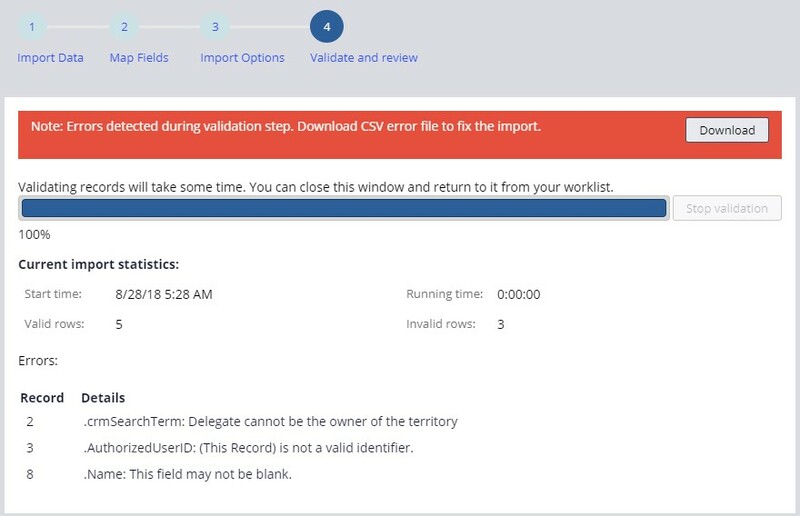 Review the list of processed, added, and failed records before continuing the import. If the entity has a parent, open a few instances in the context of their parent with which they are associated. If files are imported in an incorrect order, associations between entities might be broken. For example, activities would not show up in the associated contact if they were imported before the contact data.